"Friends" groups are independent non-profit organizations dedicated to assisting a particular park. These groups help with special events and programs, park maintenance, planning, fundraising, staffing nature centers and advocating for the park. There are currently 14 friends groups actively supporting Delaware State Parks. Friends of Cape Henlopen State Park is the "friends" group working to support the Cape Henlopen park. We have a wide variety of programs...many of which are unique due to the geographical location and environmental diversity of the Cape Henlopen area. FOCHSP is a volunteer 501(c)(3) non-profit organization governed by an 11 member Board of Directors. Directors serve 2-year terms which are staggered. Directors are limited to three consecutive terms. Elections are held every January for new Directors and Directors wishing to serve an additional term. Following the election, the newly elected Board of Directors chooses its officers for one year terms. The outgoing President takes the title of Immediate Past President and remains on the Board for one year as a non-voting member. Board meetings are held on the 2nd Thursday of each month (except July & December) at 7 PM in the Biden Center. All members are welcome to attend Board Meetings. Our President, Stu Schmidt receiving the 2017 Outstanding Volunteer Award from Gov. 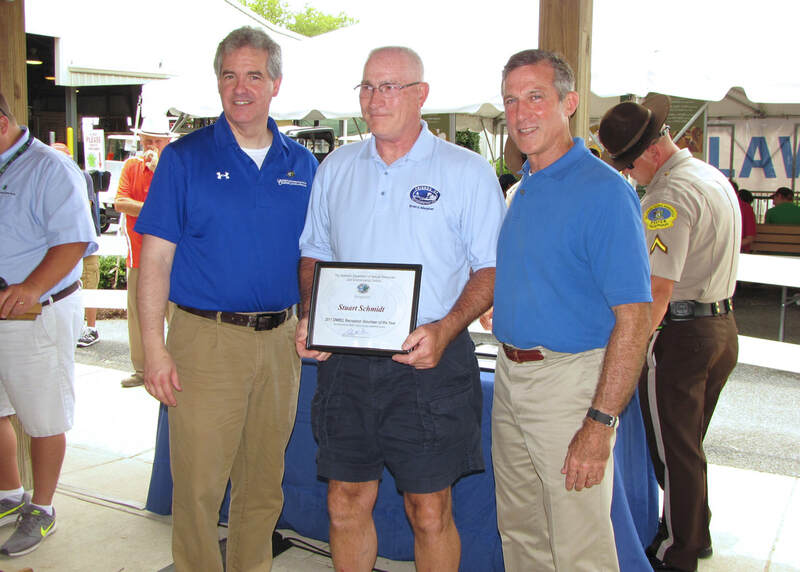 John Carney & DNREC Secretary Shawn Garvin at a ceremony in Dover on July 27th honoring his leadership, innovation & dedication to the park As of June he had completed a staggering 700 hours of volunteer service!